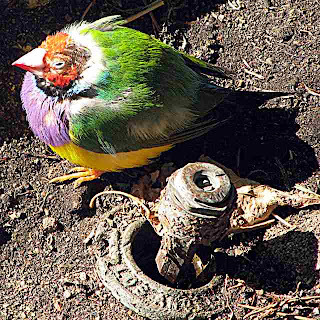 Here are a bunch of recent photos of our avian friends, all taken in my immediate environs of Pasadena California. The first shot, pigeons in a light pole line up, is one I've wanted to take for a long time but it had to wait until I got the new higher-zoom point and shoot. I've also wanted to use the camera for pictures of the crows because they won't let humans get close to them. I haven't seen many around lately. 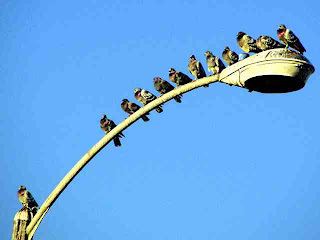 It would be really cool to capture a flock of wild parrots flying in bright sunlight. All those flashes of green are impressive. Probably never happen. 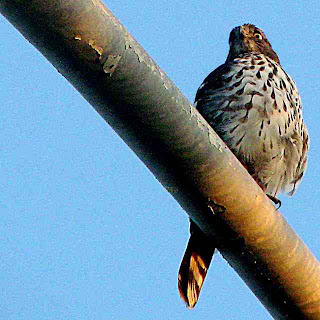 Yesterday I saw a hawk fly out of a tree, cross a street and land on a traffic signal pole. It ignored me, right below it, as it scanned the area for a juicy pigeon. 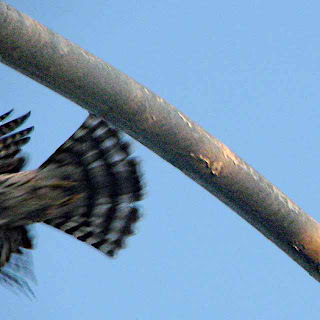 I waited for a chance at another of my most-wanted pictures - a hawk in flight. I was lucky to get just the tail. Maybe I'll get the whole bird next time. The bricks in the picture below are actually painted plywood - a phony facade to hide cellphone antennae. 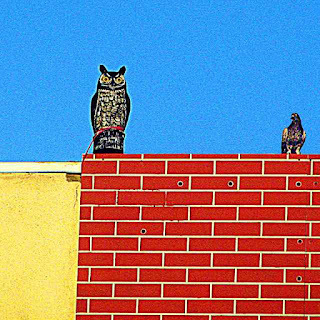 The fake owls are to keep pigeons away. Certain pigeons, however, are fearless. 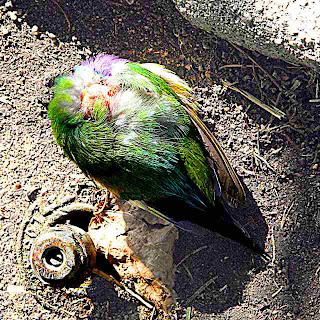 Several days ago I noticed this little colorful ball of fluff in a small lawn sprinkler excavation next to the sidewalk. I stopped to take a picture of it. 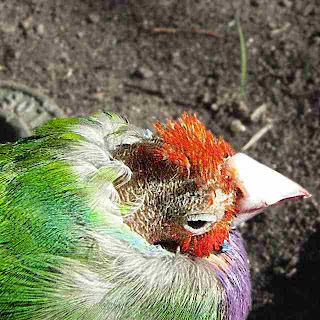 This tiny bird was somewhat the worse for wear - lethargic and missing a lot of red head feathers. I suspected it was on the ground because it couldn't fly. While pondering whether I should leave it to its fate I stepped back as a gaggle of high school students passed by. One student (the absent-minded tall one) noticed the bird. Another (I guess a future mass murderer) said "Kick it." There was a small chorus of female voices saying "No". The gaggle walked on forgetting. I poked birdie with a small stick and was relieved that it had functioning legs and wings. It flew into a nearby tree. Here's my last view of it, blending into the surroundings but almost certainly just waiting to be some predator's dinner. 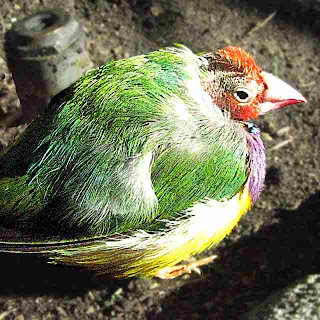 When I looked at this picture I noticed bands on its legs - white on the left, black and red on the right. Our outdoor cat, MacTabby, has never brought us presents before. 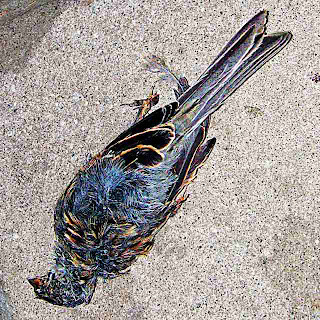 But this dead bird appeared on our front porch recently. A few hours later it disappeared. I don't want to know. 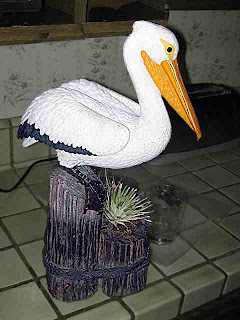 Finally a bird inside our house: a statue of a pelican with a bromeliad growing on the base. Leslie won this at a meeting of LAUPS. I liked it enough to add it to our Kitchen Kitsch Korner. The pictures all get bigger if you click on them. 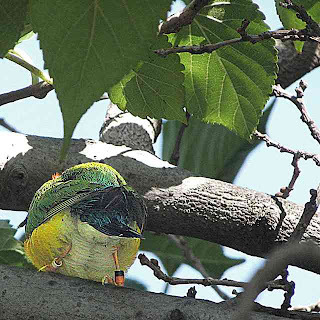 Pasadena may have birds, but not the dumbest birds. 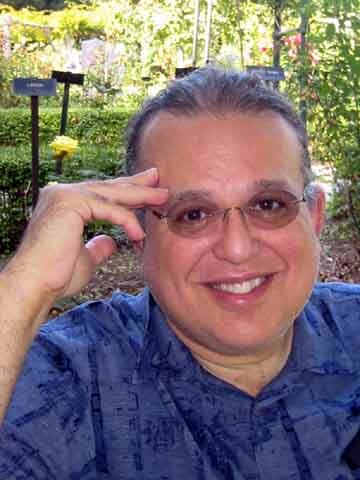 Here's an amusing bird brain post at Alex Shapiro's green-colored blog about making music with seaweed. Here, here, here and here are previous M.M. posts with pictures of birds. Here's my first and only backyard hummingbird picture - posted last August on Mixed Messages.